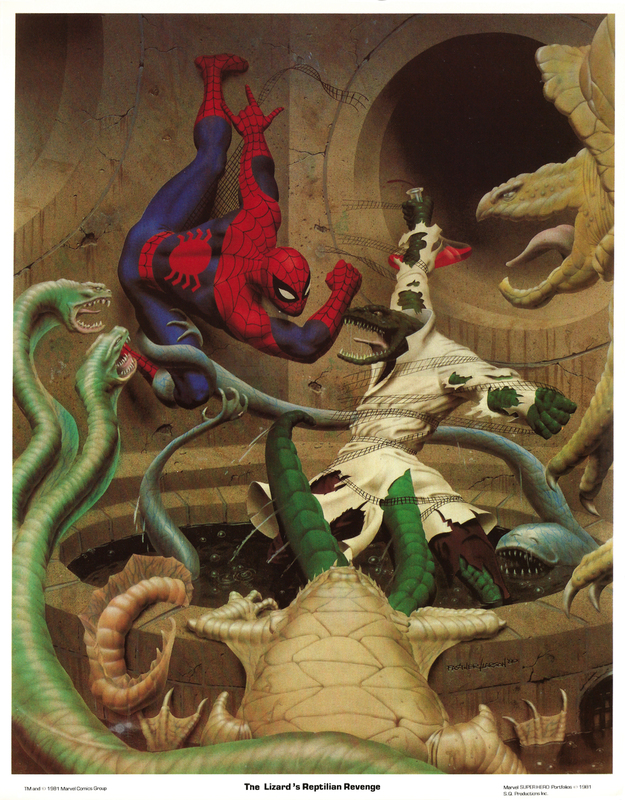 The Amazing Spider-Man Portfolio, Set One (1981) | 'TAIN'T THE MEAT… IT'S THE HUMANITY! 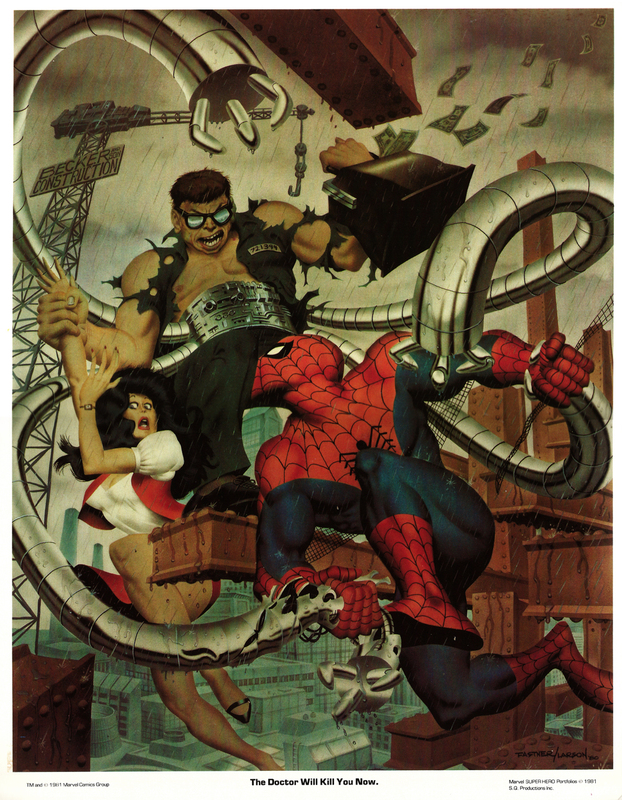 Another day another vintage Marvel Comics portfolio – this time it’s The Amazing Spider-Man Portfolio, Set One. Published in 1981 by SQP, a year after the release of the first two Marvel Super Hero Portfolios that featured The Uncanny X-Men and The Incredible Hulk, this set also included four 11 x 14 inch colour prints painted by the artist partnership of Steve Fastner and Rich Larson. 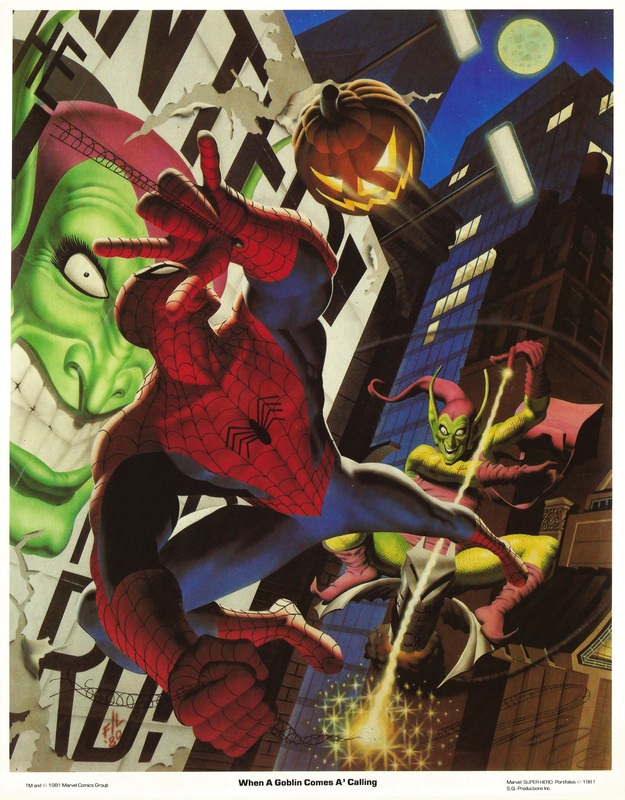 Continuing the style of the previous sets the prints show four dramatic scenes featuring Spider-Man in battle against some of his deadliest foes and were printed on white card stock. Some of the paintings work better than others, with the first two – “The Doctor Will Kill You Now!” and “The Lizard’s Reptilian Revenge!” – being particularly good. 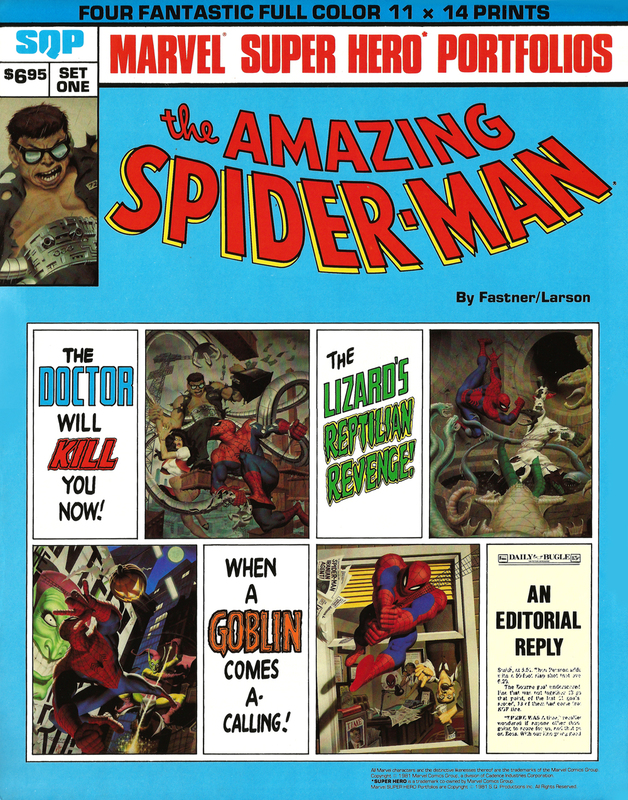 But in the last two Spidey looks a little strange, especially in the fourth print (“An Editorial Reply”) where his head is out of proportion to the rest of his body (and where’s his neck?). 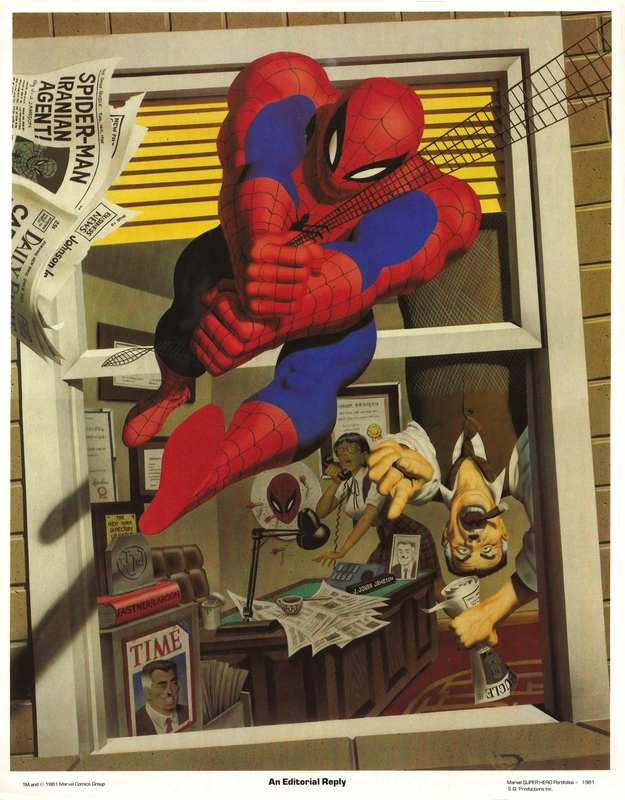 The inside of the cover sheet was printed in black and white and featured ads for other SQP products, including portfolios by Neal Adams and The Art of John Byrne book. Like the Hulk Portfolio, this one was also labeled ‘Set One’ but a second collection never appeared, which is a shame as I’m a big fan of painted Marvel artwork, especially from the late ’70s and early ’80s when the style was in its infancy. 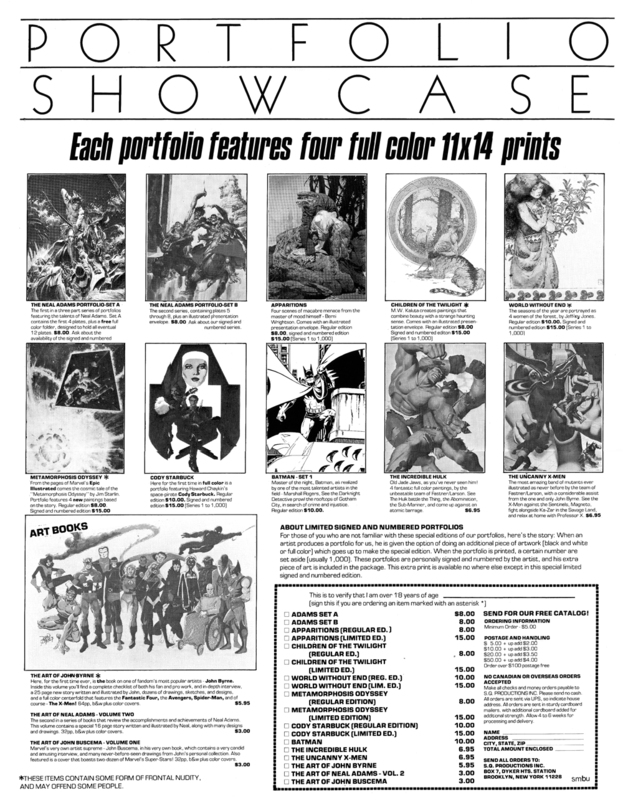 There was only one more set of Marvel Super Hero Portfolios published by SQP after this one: The Uncanny X-Men Portfolio Set Two from 1983.